For new construction or remodeling projects, White Block Company's Egress Window Well is a great solution. White Block Company Inc. has been producing quality pre-cast products for many years. We have added an Exposed Aggregate Egress Window Well to our production. When we designed the window well, we involved the local municipalities to make sure it met their standards. 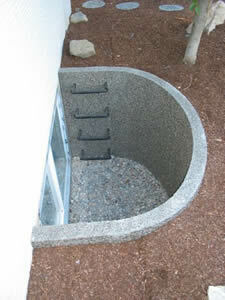 Our egress window wells outside dimensions are 81" wide, 48" deep and is available in two heights - 48" and 60". Each one includes ladder rungs for entry or emergency exit and a set of anchor bolts to secure the window well to the concrete foundation. Each window well is sealed to a semi gloss finish. Custom colors and smooth textures are available on a special order basis. We also offer an optional Window Well Cover that provides a strong and safe cover to protect children and animals from falling into the egress area. For emergency exit, the hatch opening lifts out of the cover. 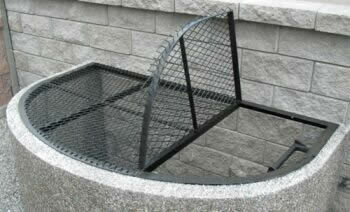 The cover is powder coated to provide great durability. Delivery is available for an additional charge. Please call for details.